Not the most beautiful of fishes, the body of the Chinese Algae Eater is plain with a notable black stripe from the tip of its "nose" to its tail. Though their color is quite variable, they are often yellowish on the sides, more brown along their back, and have a yellow eye. The stripe is often broken, and there can be black spotting along the back and at the base of the dorsal and caudal fin. They have an under slung mouth which forms a sucking disk, perfect for anchoring to a surface especially in fast moving water. Omnivore. Feeds heavily on vegetable matter, but will also ingest worms, insects, and plankton. You ll need patience and a bit of luck. Try to copy their natural habit; Lots of plants especially. They re egg-layers. The fry hatch in 2-3 days. Newborns like to eat algae and fallen food. When young they are a good community fish. 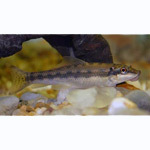 The busy young Chinese Algae Eater will go about its business of greedily foraging algae from the glass sides of the tank, the plants, the substrate, and any decor. When it gets older however, it can start to defend a territory and can continually harass tankmates. They are especially cantankerous in groups of more than five individuals of their own kind, adult specimens are often best just kept alone. In its native countries, it is cooked or made into prahoc, a pungent fish paste.